There is nothing better than enjoying a few special bottles at home with friends. Wine has a rare ability to create lifelong bonds, so it is especially rewarding when I have an opportunity to share those wines with people who have encouraged me from the very beginning, something I never take for granted nor will ever forget. I suppose the days of talking about Clos des Goisses as under the radar Champagne are over, but there was a time not too long ago when Clos des Goisses had a much lower profile than it does today. Clos des Goisses has a rare ability to develop beautifully in bottle, taking on shades of richness and pure dimension that are unique and compelling. The 1990 Clos des Goisses was in great shape this night, with superb depth and plenty of warm, oxidative complexity. Showing pretty much at peak, it is hard to see the 1990 improving from here, but it has also maintained more than enough freshness to make me think it will continue to drink splendidly for years. What a gorgeous Champagne the 1990 is. Two wines from Bruno Giacosa, both from my cellar, were spectacular. They only had one previous owner, which is one of the main reasons why every bottle I have ever had of these two Piedmont icons has been off the charts. It was a true pleasure to share these gems with passionate Piedmont collectors with a deep appreciation and love for the wines. Giacosa’s 1964 Barbaresco Riserva Santo Stefano was pure finesse and silk on the palate, with sweet dark red fruit, captivating perfume and more refined, seductive tannins imaginable. I have had the privilege – and it is a privilege – to drink the 1964 a number of times and it has never been less than an emotional wine. Even though the 1964 has surprising freshness for a wine of its age, the fruit is starting to lose some of its intensity, so I plan on finishing my remaining bottles over the next year. Believe it or nor, Giacosa’s 1971 Barolo Riserva Rocche di Castiglione Falletto was even better. Still firm, tannic and ferrous, the 1971 was the proverbial iron fist in the velvet glove. How do you describe a wine like this? Constantly changing in the glass, the 1971 was at times floral, at other moments more savory, but always intense, layered and marvelously complex. The 1971 Rocche (from Castiglione Falletto not Falletto) remains one of Bruno Giacosa’s masterpieces. In any other setting, Giacomo Conterno’s 1945 Barolo would have been spectacular. 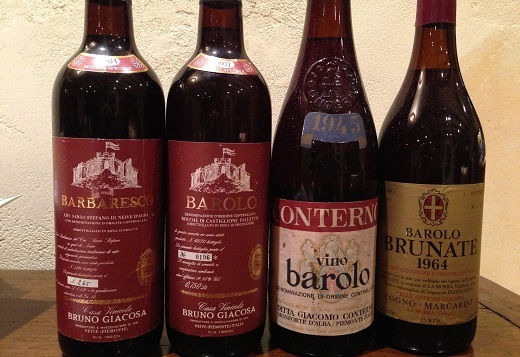 War era Barolos are incredibly hard to find. Today it is virtually impossible to imagine what conditions must have been like in Piedmont during this period, not just because of politics, but because in the 1940s Piedmont was very poor and much more agrarian than it is today. The 1945 Barolo was pure, sweet and ethereal, not quite as compelling as the very best examples, but still quite pretty and certainly memorable. The 1964 Barolo Brunate from Cogno-Marcarini is another wine that would have merited its own dinner. Still rich and broad shouldered, it showed plenty of intensity and depth. Here, too, only the memory of a perfect bottle seared on my mind kept from loving the 1964 more. 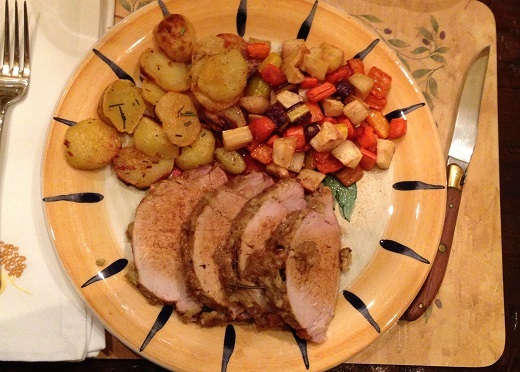 Dinner was simple, generous and comforting, exactly what dinner at home should be. Thank you to our generous hosts for opening their home to us, and for their incredible hospitality.